Impact Wrestling presented a taped show from Windsor last night. Impact Wrestling presented a show on Twitch and Pursuit last night from their recent TV tapings in Windsor. 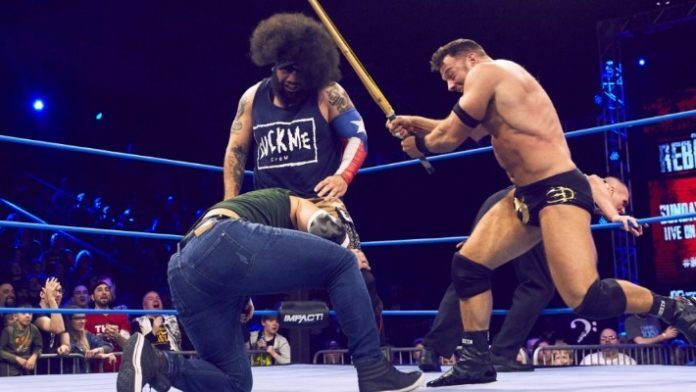 Eddie Edwards and Eli Drake picked up the upset victory over LAX last night in the main event. They received some help from Pentagon Jr. and Fenix, however, who provided a momentary distraction which allowed Drake and Edwards to gain the advantage. The tag champs then continued the attack on LAX after the match was over, perhaps to soften up their opponents before Rebellion. The two teams will face each other in a Full Metal Mayhem match on the PPV. Pentagon put Santana through a table to conclude the show. Tables and all other weapons will be legal at Rebellion. Jordynne Grace defeated Madison Rayne this week to earn another title shot against Taya Valkyrie. The first time the two met, Valkyrie utilized her champion’s advantage to duck tail and run, resulting in a count-out victory for Grace. After Grace’s victory tonight, she was attacked by Knockouts Champion Taya Valkyrie. Impact World Champion, Johnny Impact, accompanied Taya as the promotion’s power couple continues to protect each other’s titles. After Grace had defeated Rayne, she was attacked by Taya Valkyrie and Johnny Impact. The Impact World Champion was going to deliver a top rope move to Grace but Brian Cage made the save. A mixed tag match was booked for next week between Brian Cage & Grace vs Johnny & Taya. Rosemary was shown in a cemetery this week. She cut a promo about Allie’s death from last week. During her promo, it may have been revealed that Kevin Sullivan (or a being in Kevin Sullivan form) is Rosemary’s father. Rosemary lamented that she could have done more to protect Allie. Williams made his return to Impact Wrestling last night with a win in an X-Division 6-man scramble match to kick off the show. Williams pinned Jake Crist after a Canadian Destroyer from the top. Is this the beginning of Williams moving back to the top of the division? Rich Swann may have defeated Sami Callihan when the X-Division title was on the line but the Draw picked up a measure of revenge on the champion this week. Callihan teamed with the newest member of OVE, Madman Fulton, and defeated Swann and Willie Mack in tag action this week. After the match, OVE continued the beatdown of Swann but Tommy Dreamer made the save. Later in the night, Impact would announce Rich Swann and Sami Callihan will once again face each other for the X-Division championship at Rebellion. Gama Singh’s Desi Hit Squad don’t have the greatest win/loss record in the tag team division, but Rohit Raju got in the win column this week. Although it took outside interference from his stablemates, Raju defeated Fallah Bah. Unfortunately for him, the action wasn’t over after the bell rang. After Raju defeated Fallah Bah this week, Scarlett Bordeaux hit the ring. Her distraction allowed Fallah Bah to take the Desi Hit Squad down with a double clothesline. This allowed Bordeaux to land a running hip attack to the downed squad in the corner. Will we see Scarlett Bordeaux and Fallah Bah team up more in Impact?